Brighton Bodyworks was established in 2011 by Amy Weinberger; a highly qualified physical therapist with proven experience helping clients recover from pain and injury. Amy is particularly highly regarded for her results working with issues relating to the low back, hip and pelvis and this has become her main focus in recent years. Amy's approach is based on holistic foundations, providing a depth of treatment and extended care beyond what many other clinics offer. Pain or movement is not looked at in isolation: your body works as a whole and your sessions will consider how the pieces all link together. Assessments are outcome-focused and treatments include an array of modalities specifically tailored to get you to that goal. That may be any combination of soft tissue therapy, joint mobilisations, METs, medical acupuncture and exercise-based care so that not only are your symptoms relieved but the root cause is addressed. Gibbons – osteopath to elite athletes and Olympians; physiotherapist and pelvis 'guru’ Diane Lee; the award-winning Jing Academy, Pain Specialist Dr Lorimer Moseley and pregnancy and postnatal industry leader Jenny Burrell. Amy also regularly attends further training and events to keep up to date with latest research and healthcare recommendations, and to network with colleagues and mentors to ensure she continues to offer the very best levels of care to her clients. 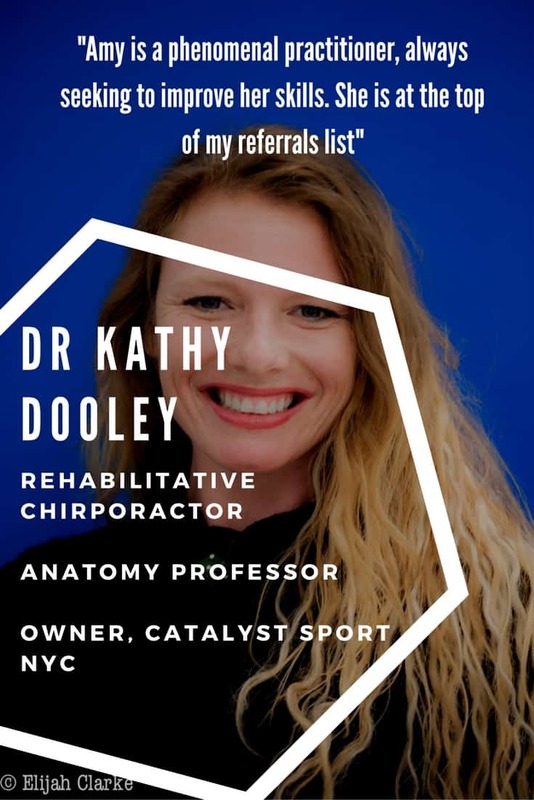 “My personal experience helps me connect to my clients; it was the enriching experience of massage during my first pregnancy which inspired me to become a therapist myself and subsequently a period of chronic low back and hip pain which gave me a greater understanding of the impact of living with chronic pain than could ever be taught.